This article was published by ComputorEdge , issue #2802, 2010-01-08 , as the cover article, in both their PDF edition (on pages 5-8) and their website. As the world goes digital, even books are doing the same, in the form of electronic books (usually referred to as "e-books" or "ebooks"). Although most book purists and other bibliophiles still prefer the paper-based versions, more people every day are discovering the advantages of e-books — so much so that there are already hundreds of thousands of books that are now available in digital form. Major publishers are increasingly choosing to offer — usually on their websites — electronic versions for sale alongside the print versions. At the same time, the term "publisher" is encompassing authors who, for whatever reason, elect to bypass the traditional publishing houses, and instead publish their own books, entirely online. A majority of these cyber books can be read on laptops and desktop computers, as well as mobile devices that can receive and display documents. Yet for book lovers who want to take their favorite titles on the road, the biggest leap forward has been the introduction of dedicated book display devices, often referred to as "e-book readers", or simply "e-readers". The books are typically in the form of PDF or EPUB files. The former are generated by and readable using Adobe software and similar applications. The latter are, in most cases, created by publishers using specialized software, with the purpose of having greater control over distribution, for copyright enforcement reasons. 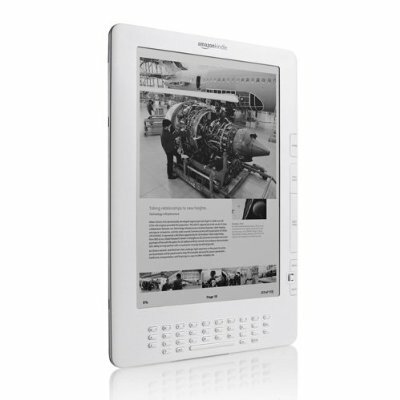 These e-readers are primarily if not wholly intended for storing digital books and making them easy to read. (More recent products can play music files, among other capabilities.) Consequently, they can eschew many of the components found in more general-purpose hardware — components such as large screens, equally large keyboards, optical disk drives, etc. In turn, these devices can be made remarkably light and slender, and thus can be easily slipped into backpacks, purses, and even large coat pockets. The e-books are stored on memory cards, and with each improvement in technological capacity, people can take a greater number of books mobile, and catch up on their reading in the serenity of a park, or the chaos of a grocery checkout line. A few of the e-book devices utilize LCD screens, but the majority of them are leveraging a remarkable new technology, electronic ink, which is able to display a screen image without the need of continuous power — unlike LCD and plasma screens. In fact, power is only needed to change the image — in this case, showing the next page requested by the individual using the device. Screen size, as measured diagonally, has varied from five inches to more than twice that. The display screens are high resolution, with crisp enough rendering of letters and images to rival their paper-based counterparts. The displays are bright enough to be easily readable in full sunlight, ideal for people who like to read outdoors. The earliest models of e-readers appeared in 2005 and 2006, and since then, with each passing year, more hardware manufacturers and booksellers have teamed up to release new generations of e-readers. But the current champion in this field appears to be Amazon.com, whose Kindle is considered by most industry pundits — as well as its legion of fans — as the leader among e-readers, and the one to beat in the future. The first generation of Kindle was released in November 2007 to a market eager to try out a device that had enjoyed a tremendous amount of marketing buzz and authentic excitement prior to its launch. Early adopters were, for the most part, pleased with their pioneering purchases. The handheld device can store over 200 books, all of which can be purchased from Amazon.com directly, oftentimes for less than $10 each. Any given title can be downloaded to the Kindle in its entirety, in less than a minute, utilizing a data network based upon EV-DO. Consequently, in order to download the latest bestsellers, you are not limited to WiFi hotspots, nor does the Kindle require any sort of wired connection to the Internet or any use of a computer as a gateway. You can choose from more than 360,000 books, magazines, and other publications, including newspapers (at least those still in business). In addition, you can download the first chapters of the available books, as a free sample, without committing to purchase the rest of the book — much like being able to browse through the print edition of a book at any brick-and-mortar bookstore. But like the paper versions we've all grown accustomed to, the Kindle is easier on the eyes than staring at a computer screen. It is also easy to carry, weighing only 10.3 ounces, and sporting equally svelte dimensions of 7.5" x 5.3" x 0.7" — lighter and thinner than an everyday paperback. Last but not least (especially for those marathon reading sessions in airports and airplanes), Kindle owners will appreciate its impressive battery life — two days if the wireless connection is left on, and a week or longer otherwise. Despite the focus on books and other printed media, the Amazon Kindle is very much a part of our global world, and the Web that ties it all together: For instance, the available newspapers are not limited to those in the United States, but include papers from France, Germany, and Ireland. Moreover, over 5000 leading blogs can be read on the Kindle, and are continuously updated throughout the day. Wikipedia, the world's most extensive encyclopedia, is also available. Even though this first Kindle model has been eclipsed by a newer version (more on that in a moment), it is still available on the Amazon.com website, through their secondary marketplace. As of this writing, the lowest price is $240 — significantly less than its original price of $399 — making it a more affordable choice than a typical netbook that an individual might have been planning to use for reading electronic books only. Not content to rest on its laurels, Amazon.com launched a second generation Kindle in February 2009. Its physical dimensions are 8" x 5.3" x 0.36", so it can easily accommodate the same 6-inch screen size as its predecessor, and yet be almost half his thin. It weighs 0.1 ounces lighter, and feature 16 levels of gray scale, versus only four in the first model. Yet probably of greatest importance to avid readers, this second incarnation features a far greater capacity, namely, a maximum of 1500 books on average — a lifetime of books for most people, all in the palm of one's hand. 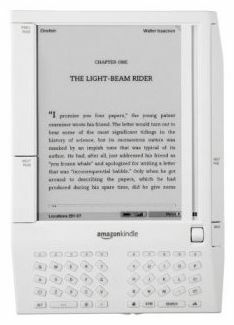 This second model is often referred to as the "Kindle 2" or "Global Wireless" or "Latest Generation", and is usable worldwide. It features a much longer battery life than its predecessor — a full week with the wireless connection enabled, versus four days for the first generation. On the topic of supported file formats, one of the key concerns for people spending roughly $10 for every digital book, is the longevity of the technology — not so much the hardware itself, but the ability to read those books using future devices. Bibliophiles who have made a significant investment in a personal library do not want to risk those books becoming inaccessible just because of some unforeseeable patent battle or other intellectual property disaster. The people who collect and enjoy books are oftentimes the same folks who spent small fortunes assembling libraries of movies on laserdiscs (remember those). Fortunately, Kindles allow you to read PDF documents, which is a real boon considering that so many of the world's books are being converted into PDF format, partly to avoid the earlier problems of digital rights management, and partly for greater interoperability on the Web. In addition, you can read Kindle books on an iPhone or iPod touch. A Kindle can be used for viewing images in all major formats (PNG, BMP, GIF, and JPEG), as well as reading Microsoft Word documents. For people who enjoy the convenience and benefits of audio books, the newer Kindles have a text-to-speech capability that allows the user to listen to books, newspaper articles, Wikipedia entries, and all other content for which audio access has been granted. This allows users to hear their content while driving, without having to purchase books on cassette tapes or CDs, or rent them from the limited collections of libraries. The latest model, the Kindle DX, may be limited to the United States only, but is far less limited in terms of book storage capacity — upping the average amount to 3500, more than double that of the Kindle 2. With the physical dimensions of 10.4" x 7.2" x 0.38", it is almost as thin as the Kindle 2, but noticeably taller and wider, which allows for a much larger screen, at 9.7" diagonal. It is also more expensive, selling new on the Amazon.com site for $489, versus $259 for the global model. In light of the huge popularity of all generations of the Kindle, it is no wonder that rival manufacturers have been piling into the market, mostly during 2009. Major players are pushing hard to make inroads into Amazon.com's lead. For instance, Barnes & Noble has introduced their "nook", which isn't scheduled to ship until mid-January 2010. (Given that it is missing the holiday shopping season, one can imagine the company's chagrin. But at least it gives them a chance to select a better product name, rather than one seemingly chosen to increase confusion among readers, editors, and grammarians.) Samsung's Papyrus has many of the same capabilities as the Kindle, but at a much more competitive price (less than $300, according to the consensus of rumors). 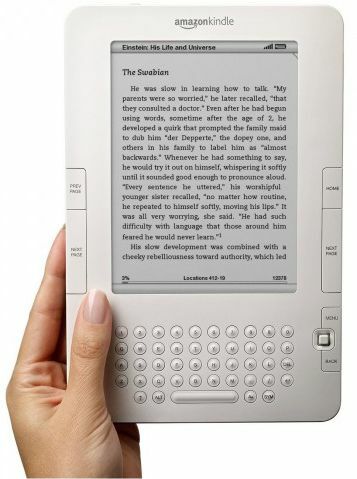 The Sony Reader is offered in several different models, and can even be purchased from… Amazon.com! It is not clear at this point who, if any company, will emerge the eventual winner. But it is obvious that the biggest winners of all are the countless people worldwide who find reading to be one of life's great pleasures, and really enjoy the convenience of having an entire library in one's pocket.